HubSpot just announced the release of two new technology platforms that promise to empower salespeople in the same way they’ve empowered marketers. 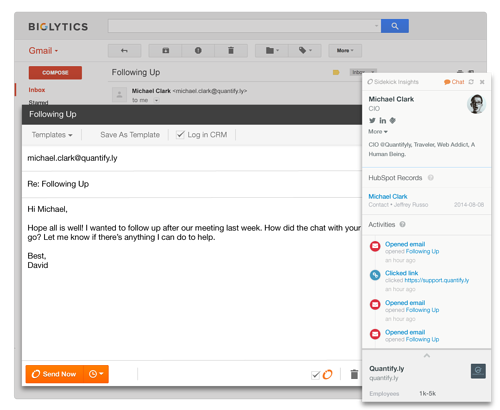 While it’s still early, both HubSpot CRM and the newly enhanced tool Sidekick look to be game changers. I deal with CRM and other sales technology all of the time. 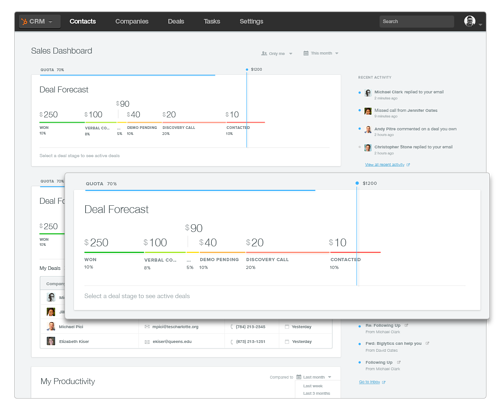 As the CEO of a fast growing company, I’m constantly assessing tools to enable my teams to do a better job. As a salesperson, I’m constantly using tools to keep track of progress and to make my job easier. As a consultant, I’m often advising my clients on what CRM and sales technology they should use. CRMs are built for compliance, not effectiveness. They’re designed for managers, not salespeople. Organizations are forced to make an unfair trade-off. Do they choose simplicity, giving up enterprise capabilities; or deal with the cost and frustration of complexity. The vast majority of CRMs were built long before the sales/marketing technology ecosystem of today existed. They don’t work within the flow of normal activities. Well, that may all be changing! It’s not a surprise that HubSpot is the company to (finally) bring a CRM to market built for the world salespeople (and marketers) live in. As co-founder & CEO Brian Halligan shared, "We started HubSpot because we felt the way consumers shop and buy had fundamentally changed. The inbound movement has helped transform the world of marketing, and we really feel like there's a huge opportunity to transform the customer experience with sales technology that enables companies to sell more, better, and faster." 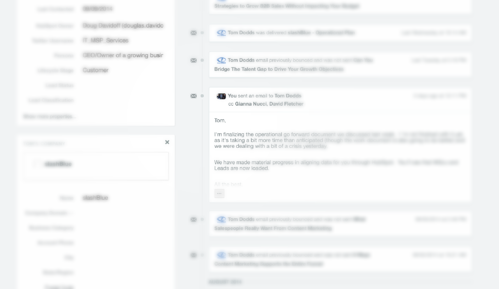 I’ve had the chance to test out HubSpot’s new CRM and I’m quite impressed with what they’ve built. In less than an hour, we were able to get it set up, synched and in use. The most impressive aspect of it is that it’s clearly built for the act of selling. With their first release, HubSpot delivers a CRM that should be considered by just about all small and mid-market companies looking to empower their sales efforts, gain efficiencies and increase the predictability of their growth. 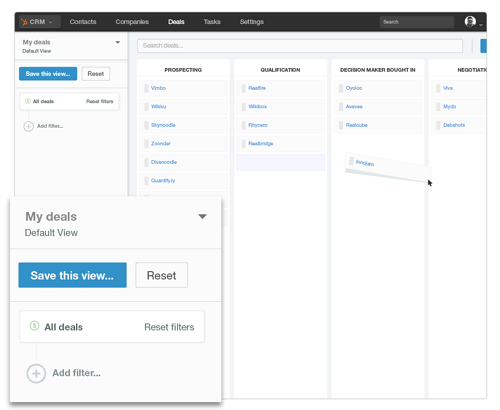 In combination with their redesigned Sidekick platform (which I will review tomorrow), they’ve developed a seamless sales enablement platform that is certain to make salespeople more productive (and happier). First and foremost, it’s designed to be used in real time. It’s not surprising that a company that was forced to put together a variety of sales technology on their own to spur tremendous growth decided to create a system with the salesperson in mind. The CRM works like salespeople do. I can enter new names into the database from a website, or quickly by entering some information in a simple form. Entering a company is as simple as adding their URL, then HubSpot crawls the web and provides a dossier on the company and contact. If you take advantage of their full package, calling the contact is as simple as hitting a button (yes, that’s right – no more time wasting time dialing for salespeople), and the call can be automatically recorded and stored within the system for later review- allowing the rep to stay focused on the conversation, and when completed, moving on to their next call. The system is also integrated with mail readers like Outlook, Apple Mail, Gmail and more. So emails that I naturally send are automatically recorded. If I’m responding to an email from a new prospect, the system automatically enters them into the database. No muss, no fuss, no excruciating data entry. 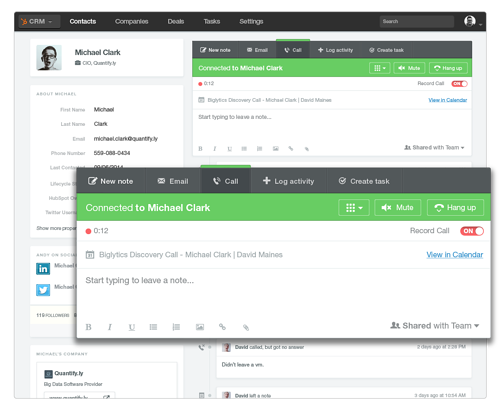 Reps no longer have to worry about logging calls, emails or other activities to keep the system up-to-date. The CRM is working in the background, allowing you to do your work – saving you time in the process. Yes, that’s right, no more arguments between salespeople and managers about keeping everything current. It’s built around how buyers buy and salespeople sell. Today the sales process doesn’t happen in a linear fashion. It happens over multiple channels, with tons of touch points. Phone calls, emails, web searches, social media, blog posts are all part of the sales/buying process. With the Timeline feature, it’s all right there and organized. As a rep, I can quickly see how my prospect has been engaging with all of our channels. What blogs posts and web pages they’ve viewed, any social media interactions and how they’ve responded to various emails. What’s more important is I don’t even have to be in the CRM to see this, as it provides a sidebar within Gmail showing me their latest activity. As a manager, I can quickly see how my reps are engaging, what’s happening and where things stand. The pipeline/deal tracker is simply a joy. A sales rep can quickly enter important information about an opportunity, and a visual display of the pipeline is presented. The rep can simply drag an opportunity from one phase to another providing a visual view of their pipeline status. While HubSpot and other marketing automation platforms have made great progress in synching and aligning the marketing tool with sales, it’s still a sync and not a full integration. 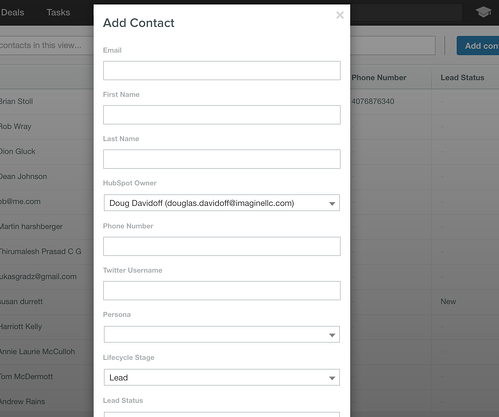 With this CRM everything is working from the same database. Sales and marketing are able to stay aligned as data is changed instantaneously with no synching, mapping or other cumbersome tasks. Marketing can quickly check in on the progress of the leads they’re creating without having to wait for salespeople to follow up with them. Salespeople will know immediately if one of their hot prospects has filled out a form, downloaded new content or engaged in some other fashion. This allows everyone to be working from the same playbook and to focus on advancing growth, rather than dealing with bureaucracy. One of my biggest pet peeves with CRM is that they’re slow. I find myself waiting for a screen to refresh or having to retype something because I’m moving too fast. So far, I haven’t experience that with HubSpot. I’ve always liked the idea of CRM, I’ve just never found one that didn’t frustrate me in a variety of ways. That frustration (as either an executive or a salesperson) always led to adoption failure. With HubSpot’s new CRM, we’re finally going to be able to marry the promise of the tool with seamless execution.